Ahh…childhood memories. Now you can have a constant reminder of how boring your life was in the “good old days” when the most exciting thing to do during the day was get down in the dirt and play marbles. Nah, really this garden ball is totally cool and you’ll find yourself coming up with all kinds of items for creating your own take on this idea. Let your imagination go crazy. 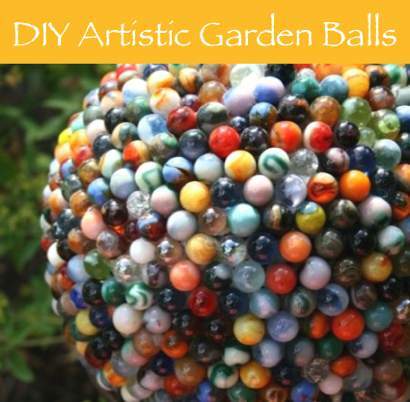 Use whatever you have laying around the house: marbles, pennies, legos, beer caps, wine corks, Matchbox cars, you name it – if you have enough of them, you can make something cool by gluing them on a ball for your garden and enjoy it everyday!